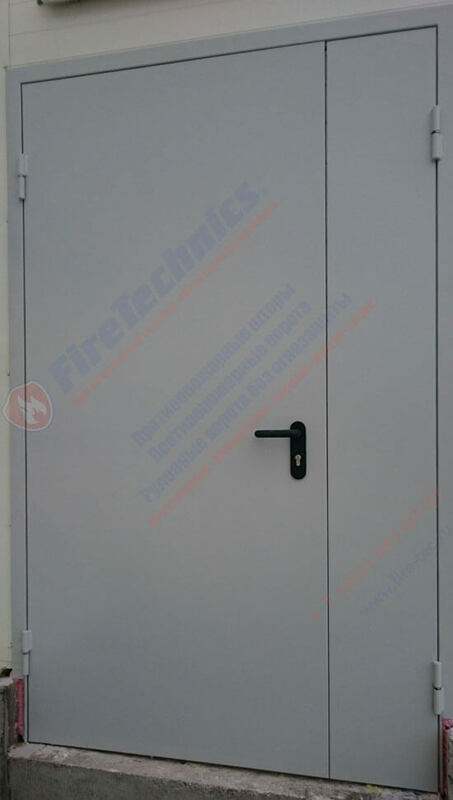 Metal fire doors EI-60 FireTechnics serve as a barrier to penetration of fire and smoke from one part of the building to another, or between buildings. Used in underground Parking lots, shopping centers, warehouses, industrial plants, etc. 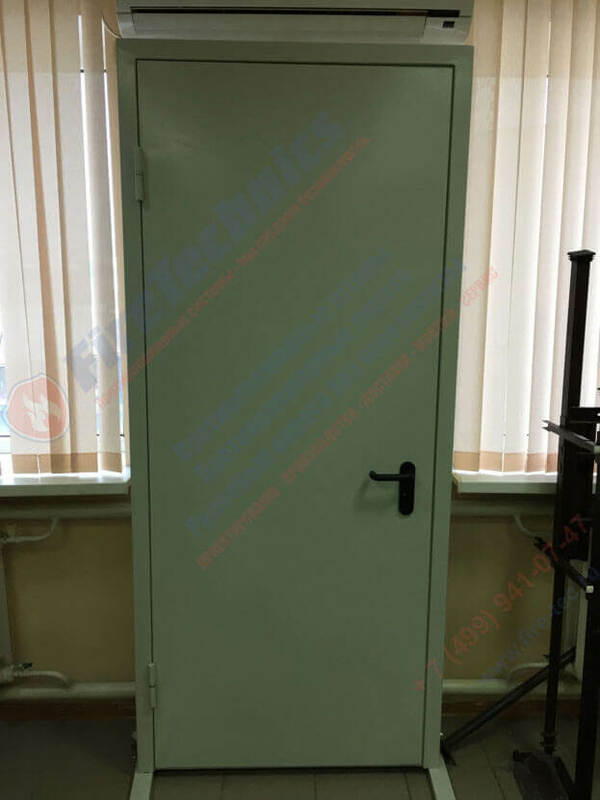 The purpose of fire doors from FireTechnics lies in the limitation of the flame propagation, and together with it the combustion products formed in the process, into rooms that are adjacent to the one in which the ignition source is located. In addition, they serve to create favorable conditions for a safe and rapid procedure for evacuating people. In addition to the main purpose, which covers the leveling of the fire threat, the doors protecting from fire danger also have a pronounced decorative function, as they become an element of the interior. Doors FireTechnics organically fit into absolutely any space, becoming a highly reliable protection against seepage from outside sounds, attempts to crack, and also have a pronounced thermal insulation quality. At the request of the customer, the doors can be executed in 1-fold or double-folded version, equipped with windows, specialized systems of “Antipanic”, drop-off doors, door closers, electromechanical locks, ACS. The door block, having a depth of 60 mm, can boast a high level of protection from the flame and its growth, fully conforming to the standard requirements of SNIP and GOST requirements. The limit of fire resistance of a design is EI 60 (sixty minutes). The mineral wool board, whose density is 130 kg / m3, acts as a filler in the canvas. The web is supplied with one sealing circuit, along the entire perimeter it is laid thermoactive tape. In the role of the locking system, a specialized single-system lock is used, as well as a cylinder mechanism with an English key of the “key-key” system. In the role of dopzaschity lock acts as a casing, made of non-combustible material. In addition, the fabric is reinforced by steel profiles, not only throughout its height, but also in the loop, as well as the lock zone. 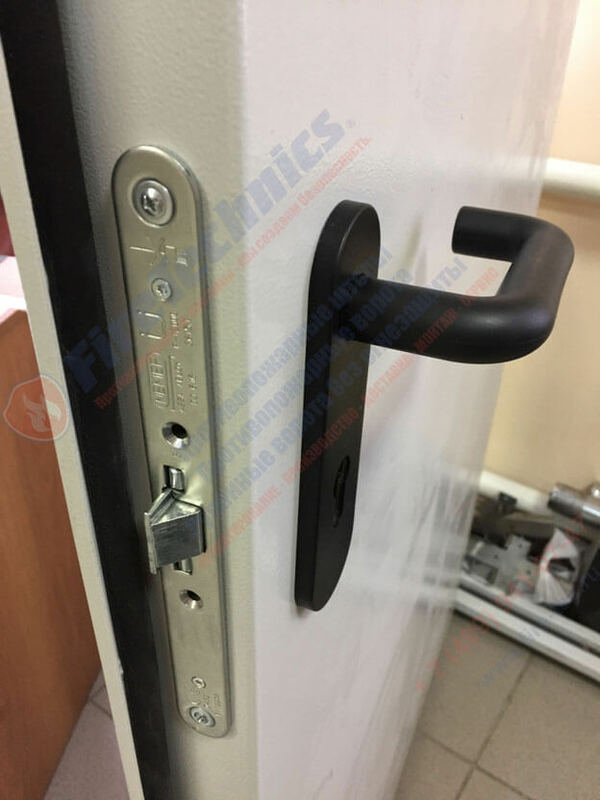 It is equipped with a pair of anti-detachable pins to prevent extrusion and break-out of the door from the opening, as well as to ensure the protection of the web from removing it from hinges by intruders. The door is covered with polyester-epoxy powder paint of several popular shades from the table RAL 7035, 5005, 7040, 9016, 8016, 9005, 8017, 3003. To the purchased door, a certificate confirming its origin, a technical certificate and a rating plate must be attached without fail. If you want, you can purchase additional accessories in the form of a door closer Fuaro DC-204AL, Doorlock77 – only 1500 rubles. What are the guidelines to be followed when installing fire doors? In accordance with the requirements specified in SNIP 21-01-97 * relating to the arrangement of fire safety systems in various buildings, the premises of all possible fire hazard classes should be separated by enclosing special structures with the appropriate norms fire-resistant limits or protected from burning barriers. Moreover, the requirements for the fencing structures of this type, as well as the protective structures protecting from fire, are advanced, taking into account the fire hazard level of the premises, their fire resistance, and also belonging to a certain class of structural fire hazard of buildings (paragraph 7.4). The area of ​​openings that are made in fire barriers, excluding fencing of elevators, should be a maximum of twenty-five percent of their area. The fill-in fillings of the enclosure shall comply with the standards specified in clause 5.14, and also clause 7.18 of this section. If it is not possible to equip the gates in the fire barriers that separate the rooms of category A and B from others, or hatches, gate and door structures, as well as valves in the web of protective elements separating the B-premises from others, it is necessary to provide A number of measures aimed at preventing further fire spread of fire, along with seepage of vapors from highly inflammable liquids and fibers, which can form blast-prone concentrates and, in the neighboring room. The effectiveness of ongoing activities should be justified. In all openings that are equipped in the body of obstacles, which can not be closed by special fire-fighting fire-suppressors or by doors, in order to establish a free communication with neighboring rooms belonging to categories B, G and D, it is permissible to arrange open-ended tambours equipped with special equipment for automated Extinguishing the fire. Fencing structures for these tambours must certainly have a fire protection function. Filling of barrier openings should be carried out exclusively with materials that are not prone to burning. Gate and door structures, as well as manholes and valves, should be made using raw materials belonging to the groups of flammability not less than GZ, protected by absolutely non-combustible coatings having not less than four millimeter layer. The doors of the locking locks, gates and hatches arranged in the barriers associated with the formation of combustible dusts can be made from raw materials classified as combustible groups of not less than GZ, having a thickness not less than forty millimeters, devoid of hollowness. 5.14 * All barriers against fire, based on the fire-resistant level of their enclosure surface, are divided into classes according to the plate number 1, barrier barriers, fireproof doors, hatches, gates, etc. – according to the plate number 2 *, and tambour gateways, They are arranged in obstructions – as indicated in the plate number 3. Overlaps and internal partitions of the vestibule locks should have a function of fire protection. Arrangeable barriers against fires according to GOST standards must belong to the class K0. In strictly prescribed cases, it is permissible to use barriers of the 2-rd-4-vertex type, referred to the class K1. * The limit of fire resistance of doors in elevator shafts is acceptable to take at least 30 minutes.